There is no sign that the rapid growth enjoyed by Aldi and Lidl is slowing down, after both discounters saw sales increase 16.8% year-on-year in the last twelve weeks of 2017. 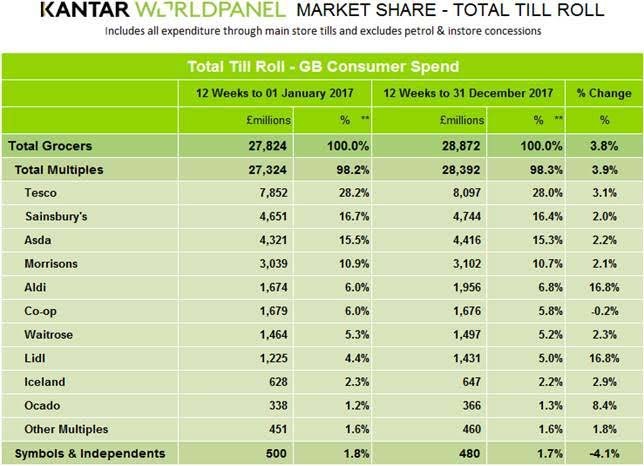 The boost meant that Aldi’s market share was up to 6.8% from 6% a year earlier, while Lidl’s was up from 4.4% to 5%, according to the data from Kantar Worldpanel. Each of the big four supermarkets grew sales at least 2%, with Tesco enjoying the strongest growth at 3.1%, and Asda – for a long time the basket case of the supermarkets – the second best, at 2.2%. But all four grew at a slower rate than the overall market (up 3.8%), meaning they lost market share. The growth of all four also failed to keep pace with the rate of grocery inflation, at 3.1%. Adam Zavalis, Aldi’s UK marketing director, said its performance had been driven especially by the premium Specially Selected range, sales of which were up 30% in December. 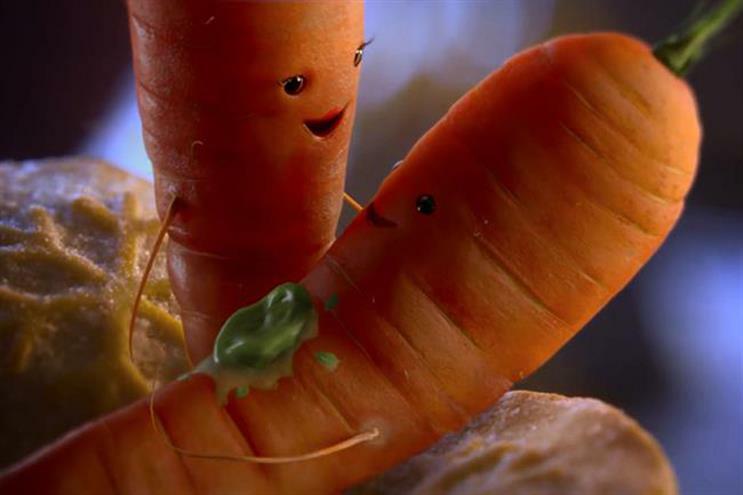 He also flagged up the brand’s ad campaign, which saw the return of 2016's vegetable mascot Kevin the Carrot and the introduction of a love interest for him. "The campaign was designed to both emotionally engage and also to sell products throughout the entire Christmas period, from the launch in early November through to the big day itself," Zavalis said. "As a food retailer, it was really important that we kept interest levels high throughout the period and didn’t simply excite people in early November and then let the excitement dwindle over the subsequent weeks. "We targeted customers by using each relevant channel to raise awareness of key products using a compelling narrative that evolved throughout to ensure ongoing consumer engagement." The campaign, from McCann UK, rated highly in a number of measures of retailer Christmas campaigns, including the Adwatch Christmas Likeability poll for Campaign, in which it placed second, after Marks & Spencer and ahead of the other supermarkets. Fraser McKevitt, head of retail and consumer insight at Kantar Worldpanel, said Aldi and Lidl’s performance was particularly notable for the festive season. He said: "In some ways Christmas is a tricky time for the discounters: they tend to lose a little market share compared to earlier in the year as many shoppers return to the more traditional supermarkets in search of old favourites. "Rising to the challenge, Aldi and Lidl collectively managed to attract nearly one million additional households during the past three months. Aldi increased market share by 0.8 percentage points year-on-year to capture 6.8% of the market, with 39% of trips including at least one product from its Specially Selected range. "Meanwhile, Lidl grew market share by 0.6 percentage points to stand at 5.0%, helped by a 22% sales increase in the dairy aisle and a £23m boost from fresh produce."